Can I make a booking through Bluebells & Seashells? Yes you can either contact the owner directly using our contact booking form, or you can select dates that you wish to make a booking for, click on the 'BOOK NOW' button which appears on the establishments listing page, to take you to the email contact form which will go directly to the booking email address provided by the property owner or manager. Who is my booking with? Your booking is made with the property or establishment directly and through our booking system. If you do email a property and do not hear back from them, you will need to follow up with them direct. Any changes, cancellations or amendments should also be directed towards the B&B, hotel, cottage, campsite etc and not come via us. Are there any charges for booking through this website? Bluebells & Seashells will not charge visitors to the site any money to search for properties, and will only make a charge when you place a booking through the website. Prices will be shown per night in GBP next to the date on the booking calender. All bookings must be made with the property owners direct or their management agencies and although most do not take any commission for bookings, you are advised to enquire about any up front costs and also any cancellation charges when you make your enquiry to ensure you are fully aware of all costs. As you are booking direct with the bed & breakfast, hotel or cottage owner, you should check their cancellation terms individually before making any bookings. How do I find out more information about the property I would like to book? Simply contact the owner or management agency direct by clicking on the contact button at the bottom of each property's page. How do I know if they have rooms available? Simply check the calender displayed on the page or contact the property owner using the contact form on the page for information. If you are not flexible in the dates of your holiday, are seeking dates at a popular time of year, or with short notice, you may want to email more than one property to find one that has the week you are looking for. We do ask cottage owners to up-date their availability on our website but this is not always possible as things can change so quickly, so please contact the owner direct to ensure that the cottage is available on your chosen dates. Are your listings up to date and 100% accurate? All the information provided for all of the establishments has been provided by the property owners. We publish this information in good faith but can take no responsibility for inaccuracies or changes to the properties that are not updated. Please confirm any aspects that are of particular importance to you with the property owner when you make any bookings - and before you travel to ensure that your holiday or visit meets your requirements. How do I register my property on Bluebells & Seashells? You can register your property with Bluebells & Seashells by going to "REGISTER NOW" on the main menu, this will take you to a page to enter your name, login details and email address. How do I create my holiday property listing? 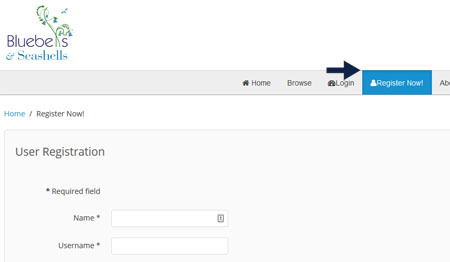 Once you have registered and receive your login details, you can use your username and password to login to the admin area. 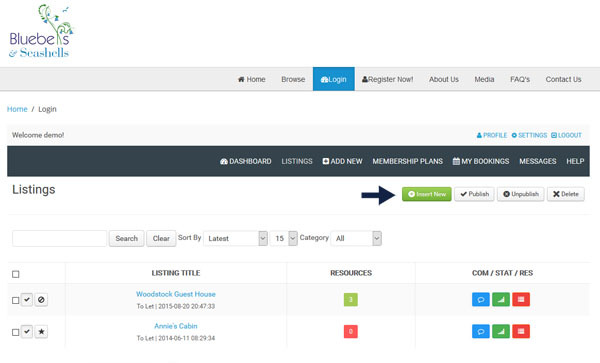 To create a listing, press "LISTINGS" on the admin menu. Then click the green "INSERT NEW" button to take you to the create a listing page. 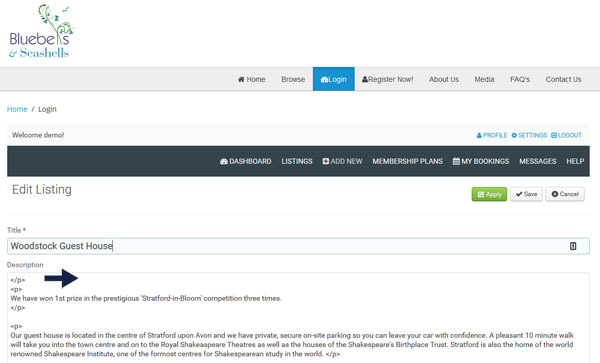 You can now create your listing, including adding a description, adding images, adding postcode location. If you have signed up to the Gold Plan then you can also set resources for our listing, which will allow you to accept bookings directly. Will you help me setup the booking facility? Yes, we will contact you once you have created your listing and help you setup everything you require and offered unlimited help support. I can't register my property. Are you able to do this for me? My address is not showing up correctly. Why is this? We use the Royal Mail's database of addresses, as this ensures we are able to place your property on to Google Maps correctly and also ensures that we have consistent entries across our site. However if you still experience problems, email us the address that you would like displayed on your listing and we will change this for you before making your property go live. How will you ensure that potential guests can find out about Bluebells & Seashells? We have a considerable number of years experience at creating column inches across the national, consumer, trade and regional press; as well as coverage across the TV, radio and internet. We are in this for the long term and will be working hard to build a brand that see's repeat business, season after season and year after year. We recognise that this is a marathon, not a sprint and accommodation owners that are early supporters of our venture will be looked after in the longer term. From time to time there are opportunities for us to promote individual properties, for example if we are asked by journalists to make recommendations, or find us a property in a specific area or which matches specific criteria. Also there are further opportunities within our newsletter or marketing emails and literature. If this happens we will get in touch with you direct. Why do you not have the same advanced search facilities for all types of accommodation? We are trying to give the end consumer the best and quickest experience possible and have done research to find out what is of most importance to them. Under our advanced search tool, we have tried to be as comprehensive as possible, while also trying not to include too many facilities that will overwhelm them and dilute the search. Why can I not put in the exact prices for my rooms? We are trying to provide a one size fits all service, which unfortunately means that property owners are not able to specify exactly how much their rooms are. We believe that consumers are looking for rooms that suit their budget, and so have attempted to group rooms into categories, such as budget, affordable, standard, luxury and premium and display prices on a per person and per night basis, rather than per room. If you would like to include more information about your seasonal, special event or single person supplement prices, please feel free to include this with the free text section of the property description during registration. How do I know that people are viewing my listing with you? During the registration process, you provided a contact email address and password. To view the traffic to your listing, go to the home page hit 'Log in' at the top right corner using your email address and password log in to view your listing. Each of the properties that you have registered with us will have their own record of traffic statistics, including visits to your page, the number of times your contact details have been opened and the number of times that people have emailed you through the website. We hope that this helps you to ensure you are receiving good value for money when subscribing to Bluebells & Seashells - and if not you are under no obligations to continue listing with us. How do I add another property to the website or amend my listing? Just log in to the website using your email address and the password set by you during registration and you will be able to amend and update your listing. This includes adding additional photos (up to ten per property), adding additional properties to your account entry without having to complete the entire registration process each time and updating the availability calender of your property if you have registered a cottage with us. 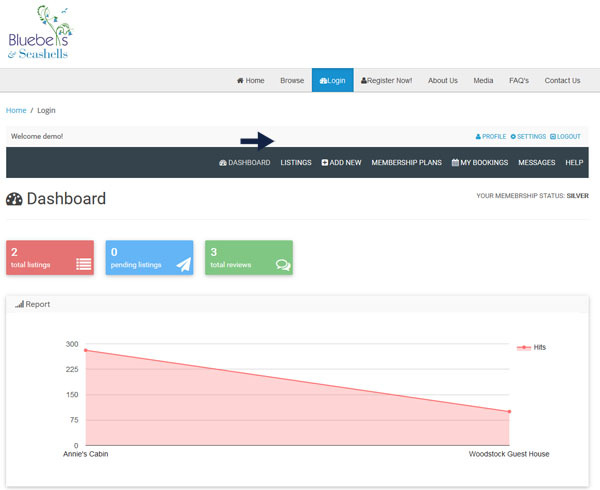 While logged in you will also be able to view the traffic to your listing. Why am I only able to add three photos during the registration process? This has been designed to ensure that the registration process is as quick and easy for you as possible. It can take some time to upload ten photos in one go, particularly if they are large image files and we don't want your computer to time out or crash and lose all of the data entered into the registration process, meaning that you have to start it all over again. To add the extra photos just log back in where all your data will be saved and add them one at a time. Can I link my website to Bluebells & Seashells? Yes, absolutely, please do. By linking to us, this will both raise your own search engine rankings but also ours. So please feel free to go ahead and do this without asking for permission.